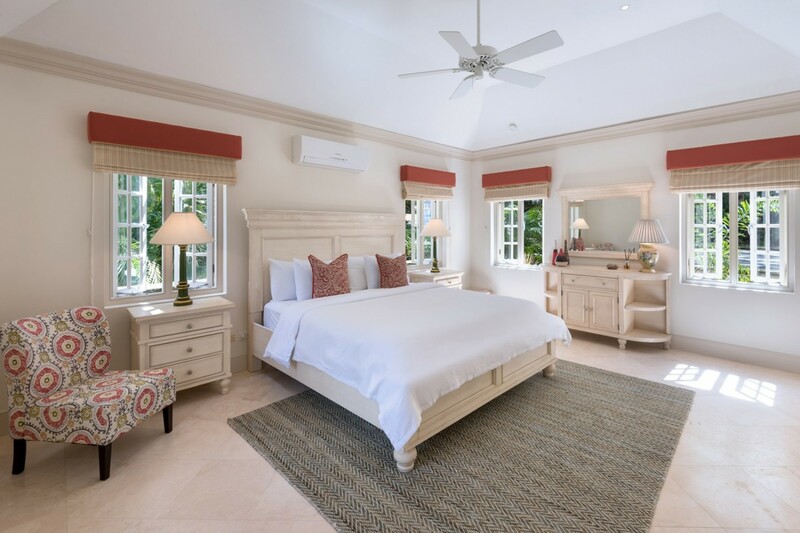 Welcome to Porters Great House Cottage, a gorgeous 3-bedroom that resides at the end of a winding lane, passing through an enchanting forest of mahogany on the Porters Estate, on the sun-kissed Caribbean island of Barbados. A quaint property from the outside, the seemingly small villa belies the spacious interior and expansive back garden that sits to the rear. The charm that this villa holds is incomparable; the red roof that sits on the walls made of local stone stands out proudly amongst the verdant green and deep dark woods of the forest and looks positively picturesque with the azure sky as a backdrop. 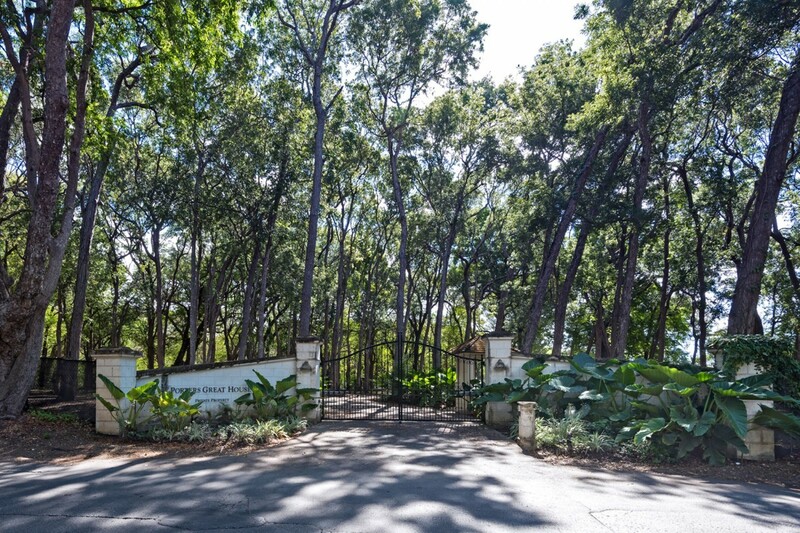 The winding laneway of the road expands at the front of the house to accommodate the vehicles of guests comfortably, and indigenous plants and shrubbery decorates the fringes of the property, giving guests a glimpse of what wonders lie behind it in the landscaped garden. Swaying palms and lazily drooping fronds, to carefully manicured shrubs and flowers, thoughtful lighting helps to bring the best features of the garden to life in the evenings. 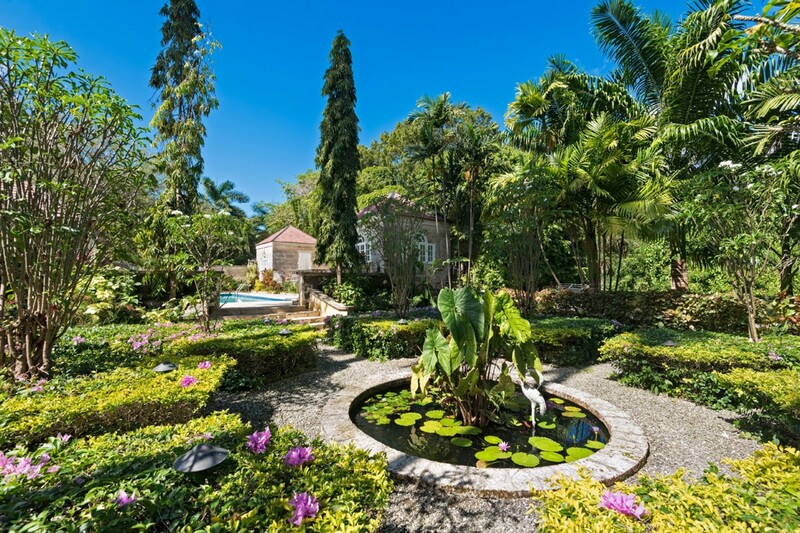 A circular pond features as a midpoint for all garden paths to trail from, and guests may enjoy the ambience and tranquility of the flora for the duration of their stay. 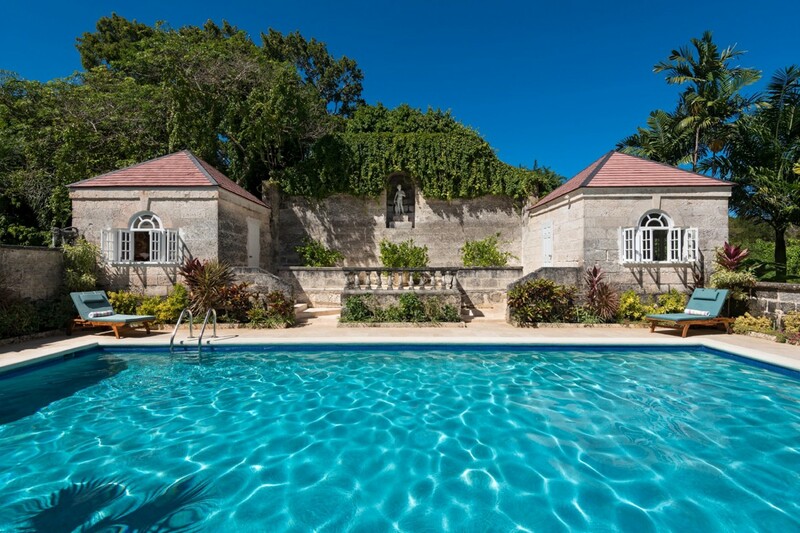 Close by, a swimming pool sits, just a few stone steps away, surrounded by a stone laid terrace. 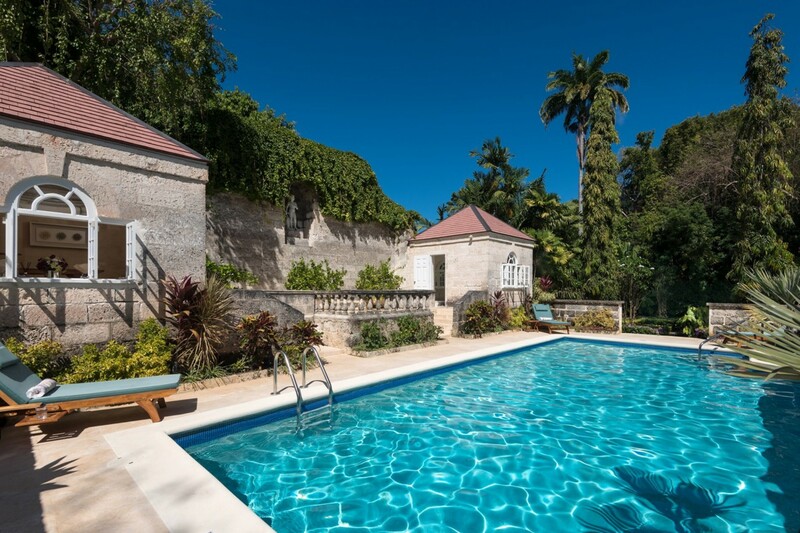 Sun loungers sit at the edge of the cool waters, making it hard to choose between topping up the sun tan or taking a dive under the cool waters, a perfect solution to when the Barbados heat becomes uncomfortable. 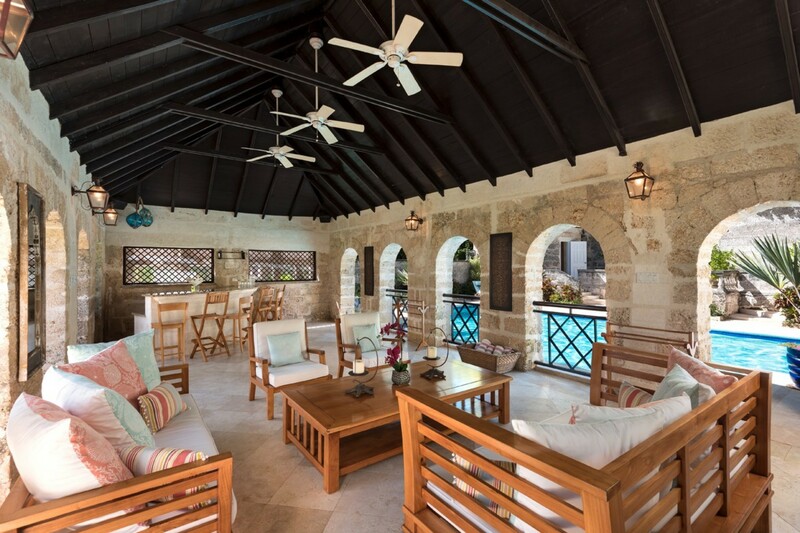 Inside, the lounge area is open plan, and extends out onto the terrace through rounded archways where the pool resides, so making plans to cool off and have fun in the sun is always a tempting option wherever you may be in the house – a basket of towels sits ready and waiting for guests to take an impromptu plunge. 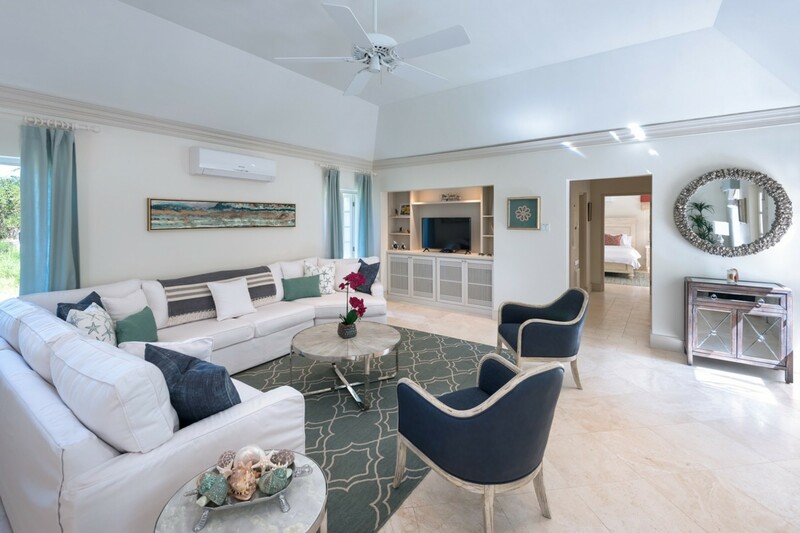 The lounge contains gorgeous wood furniture, decorated with comfortable textiles and cushions, and surrounds a solid wood coffee table; overhead, ceiling fans make this an ideal spot for the easy flow of pleasant conversation, maintaining a comfortable temperature and ventilation. 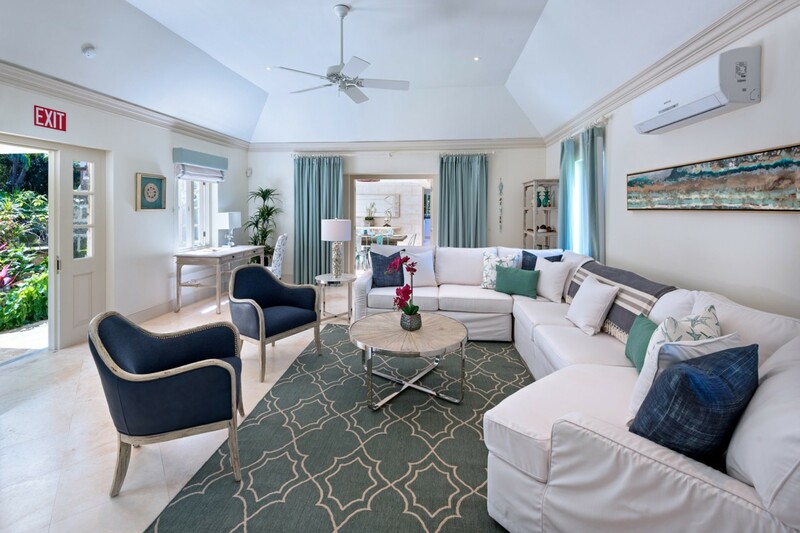 The lounge, located in the older section of the villa with the master bedroom, accesses the newer wing, which contains the dining area and kitchen, as well as the remaining two bedrooms. 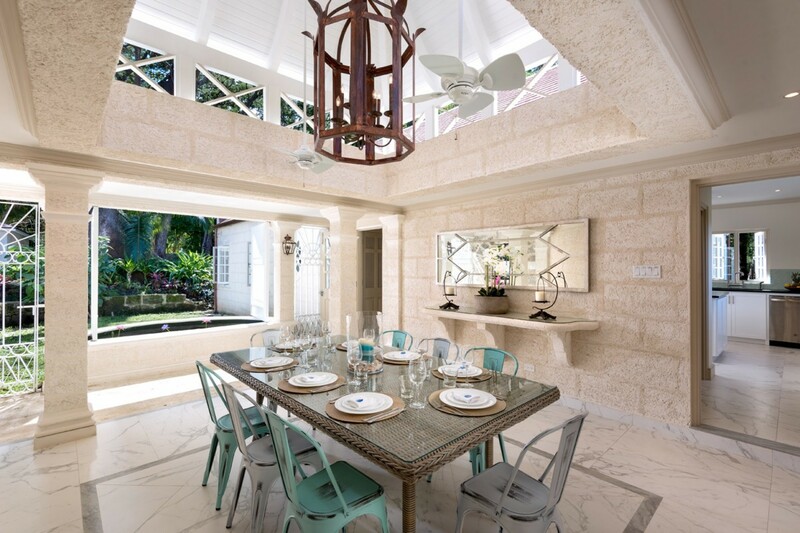 The dining room, sitting adjacent to the kitchen, displays a rustic opulence – looking out onto a section of the garden with an elevated lily pond just outside the window, the floors are tiled with smooth marble, but the walls and pillars are constructed with rough-hewn coral stone, dressed in white coving. 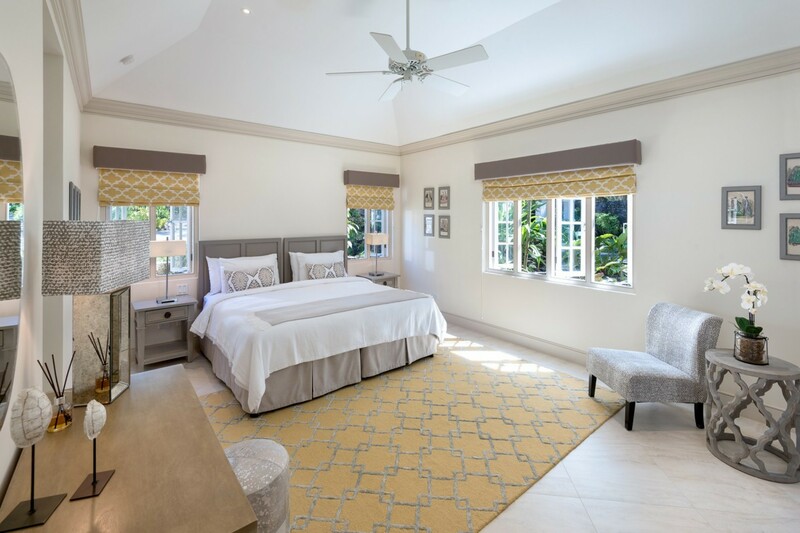 The ceiling overhead is designed with the intention to ventilate the room while maintaining the aesthetic of the villa – the vaulted wooden beams of the ceiling is crowned with a large cage chandelier. The kitchen is modern and sleek – state-of-the-art appliances and smooth worktops make for an efficient workspace, with ample cabinetry for storing food and delph. 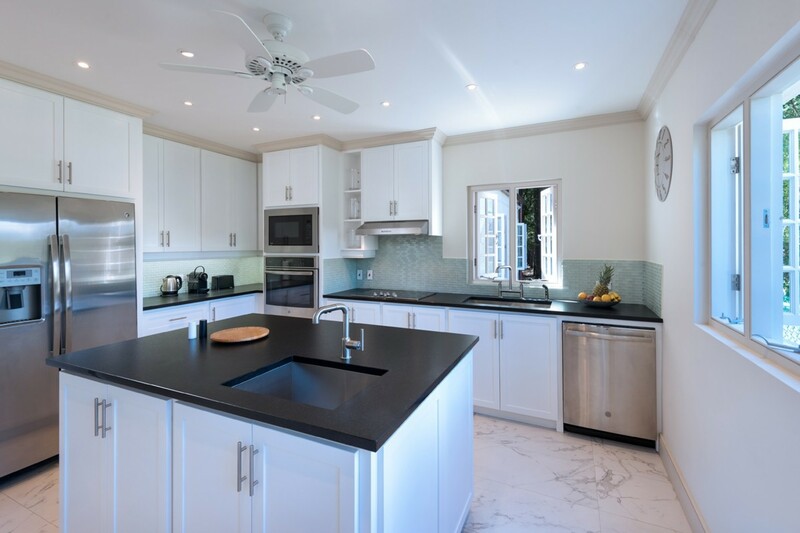 Paired with the services of a professional chef, guests are afforded the opportunity to sample the culinary delights of Barbados cuisine, with delicious food, made from local produce, without having to leave the comfort of the villa. 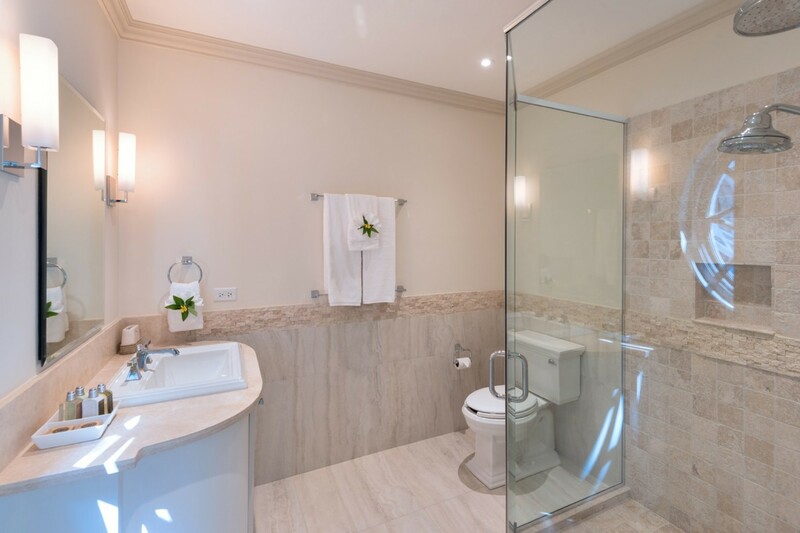 All rooms of the villa are based on the ground floor, including the bedrooms. 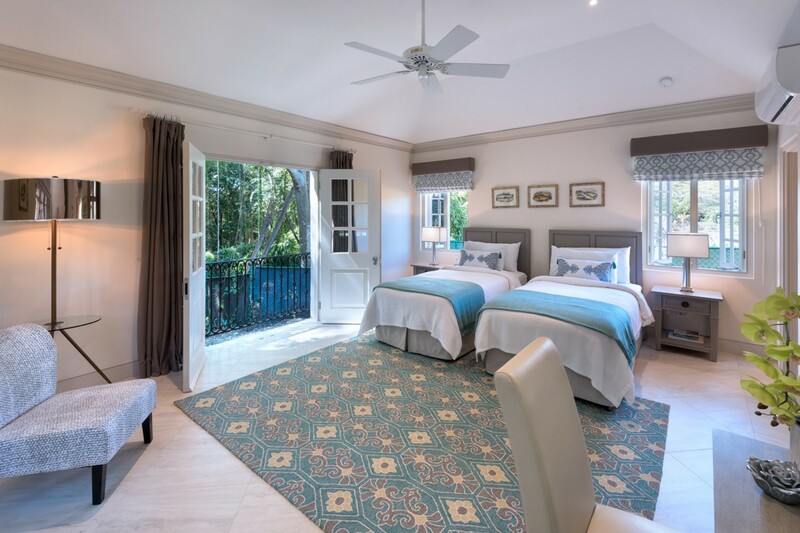 Bright and airy with high ceilings and softly coloured textiles to promote a sense of peace and tranquility, each of the rooms have a luxurious king size bed within, with the option for separating them into twin beds available for the bedrooms in the new wing. 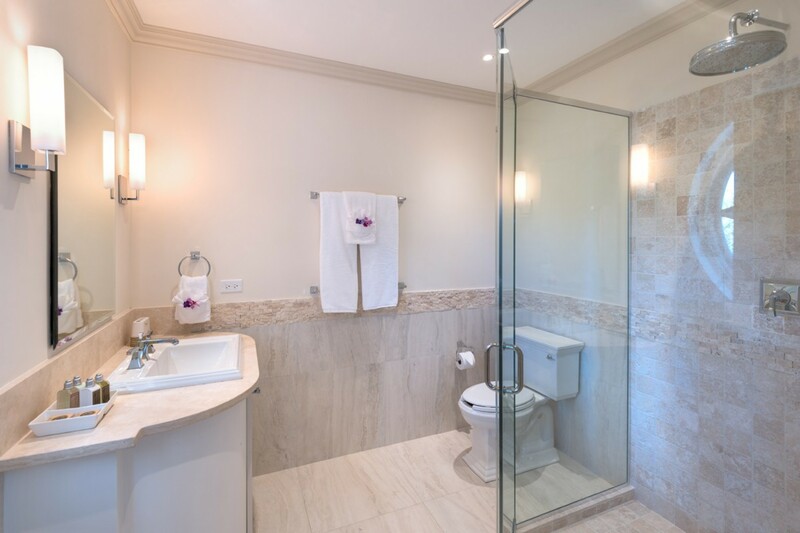 Each room has an en-suite bathroom with walk-in shower that may wash away the cares of the day and soothe the body from a long day of exploration and activity. 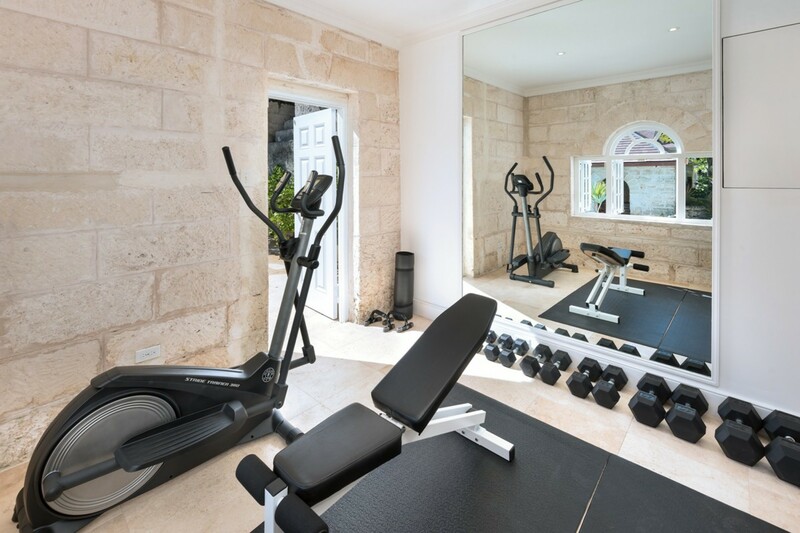 Located on the island of Barbados as the first port of call to the Caribbean Sea from the east, Porters Great House Cottage offers both complete privacy and security, but also maintains ease of access to Holetown and the amenities, shops, restaurants, clubs and pubs that populate it. 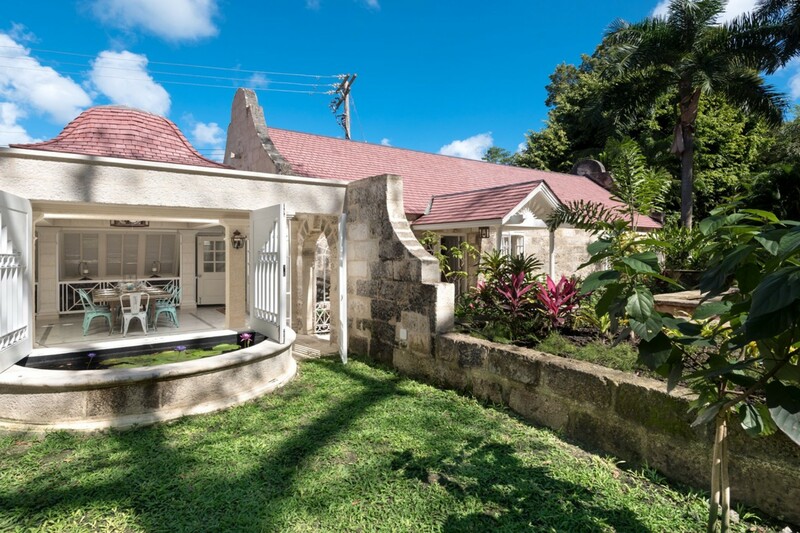 Barbados has a colourful past and a rich heritage, which guarantees that guests will not be stuck for activities or excursions, not to mention historical interests. As Barbados is a relatively small island, most destinations and sightseeing spots are within easy reach of a few hours’ drive. Further afield, Bridgetown lies to the southern side of the island, with an array of sights to see and explore, from historic buildings and natural vistas, to fun and exciting activities, with a sprinkling of retail therapy in between. 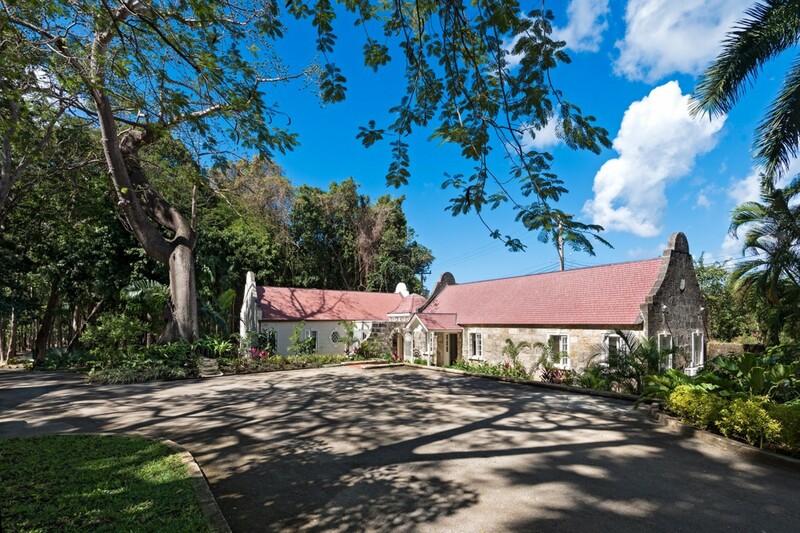 If the enchanting mahogany forest that encloses the property doesn’t suffice, the wonderful Petrea Gardens are just over half a kilometer away from the property, filled with the indigenous flora and fauna that live on the island. 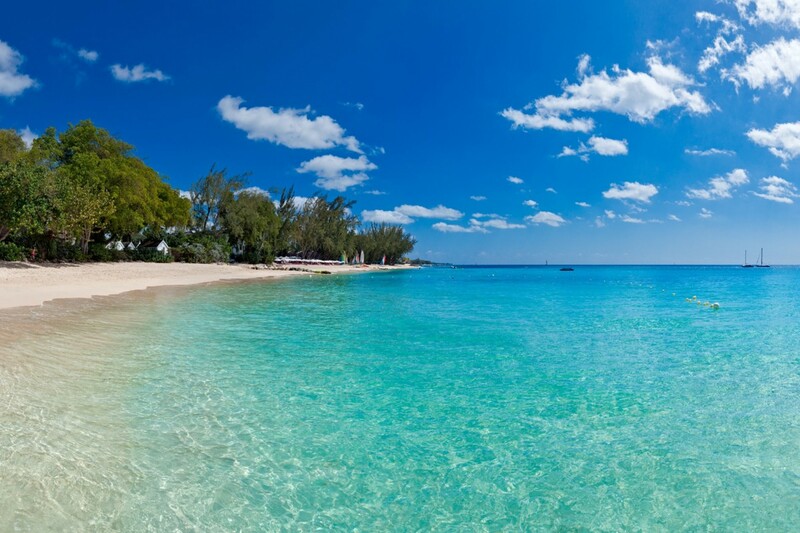 The nearest beach, Heron Bay Beach (550m) is within easy walking distance, along with a whole host of other beaches for guests to enjoy dotted around the coastline.